It represents companies that account for about 1 billion euros in foreign investment, or 35 percent of the total foreign investment stock in Latvia. It advocates a better business environment and the adoption of a fiscally responsible macroeconomic policy. Over the years, the Foreign Investors Council in Latvia (FICIL) has increasingly found itself working as a consulting body on Latvia's long-term strategy and vision. This past summer, FICIL made a number of suggestions to the Latvian government on macroeconomic policy, labour issues, energy policy and the industrial investment environment. As the government prepares its 2009 budget, are FICIL’s suggestions being implemented or taken into account? The Foreign Investors Council in Latvia brings together the largest companies that have made significant investments in Latvia, as well as seven chambers of commerce. The group includes such players as Bite Latvija, Dalkia Latvia, GE Money, Rimi Baltic, Swedbanka, Narvesen Baltija, Neste Latvija, Latvija Statoil, Linstow, Stora Enso, among others. While it does not do any lobbying or represent the interests of individual members, FICIL collectively identifies common problems shared by its members as well as issues which affect business operations in Latvia. It tries solving these by pointing out needed changes in legislation or administrative procedures to government agencies. In its quest for a better business environment, FICIL has established an on-going dialogue with the Latvian government on the investment climate in Latvia. 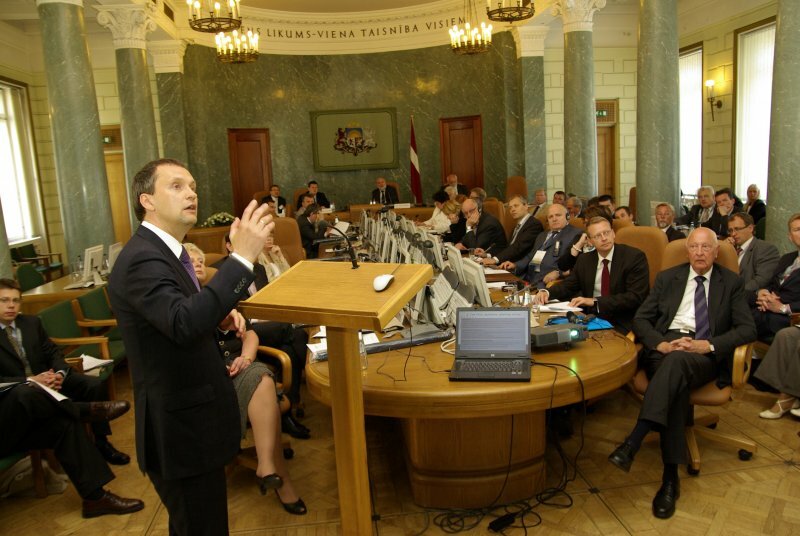 Since 1999, its most high-profile events have been its annual High Council Meetings, which are jointly chaired by Latvia's prime minister and a CEO from a FICIL member's parent company. The most recent one took place on June 5, 2008 and was chaired bu Latvian Prime Minister Ivars Godmanis and Dr. Gunter Dunkel, Deputy Chairman of the Managing Board of NORD/LB Norddeutsche Landesbank Girozentrale. For the High Council Meetings, FICIL traditionally prepares position papers on the most important current issues. The government has listened and has acted on some, but not all, of these recommendations. Over last few years, FICIL has actively advocated the adoption of a fiscally responsible macroeconomic policy. It was already sending warning signals in 2005, when inflation figures were a cause for worry and few seemed to be concerned. FICIL's advice to the Government, in October 2007, which suggested a serious systemic change in Latvia's taxation system and sent a strong signal concerning the conditions of the investment climate in the country, remained unimplemented before the start of the 2008 economic recession in Latvia. Again this year, FICIL has made a number of suggestions to the government on macroeconomic policy, labour issues, energy policy and the industrial investment environment. The foreign investors group has pointed out that although in general "Latvia is publicly welcoming foreign investment projects in various fields of economy; in practice, the current legal and administrative system fails to keep up with the investment development pace.” According to FICIL, legislation and bureaucratic practices lack the necessary level of predictability and transparency, thus significantly slowing down the business development process. This is a particular concern for the implementation of large-scale investment projects. FICIL believes that Latvia – in order to maintain its competitiveness in the region for attracting foreign investments – must take "a qualitative leap towards more efficient planning and implementation.” Improved territorial planning and more predictable construction processes, the development of a sustainable labour supply policy, energy efficiency issues, and taxation system improvements are just some of the aspects of the criteria used by investors when they decide if Latvia is the right location for their projects and, as such, these issues are covered in the latest FICIL position papers. The Insider spoke with Andris Laucins, Chairman of the Executive Board of FICIL and a partner at Ernst & Young Baltic, against the background of a flow of bad news for the global and Latvian economies.